To see a virtual tour of some of the facilities at Jefferson Lab, click the name of a building below or hover over a building on the map. When hovering, you can read about the facility, or click the building image to take a video tour. To see the entire tour, click here. You can also learn about our 12GeV Upgrade. Jefferson Lab's mission is to provide forefront scientific facilities, opportunities and leadership essential for discovering the fundamental nature of nuclear matter, to partner with industry to apply its advanced technology, and to serve the nation and its communities through education and public outreach, all with uncompromising excellence in environment, health and safety. 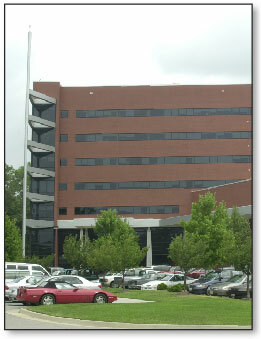 Adjacent to the Jefferson Lab campus is the Applied Research Center, or ARC. Built by the City of Newport News, it is home to industrial, commercial, university and Jefferson Lab researchers collaborating in the development of new technologies. CEBAF Center is Jefferson Lab's main administration building. It provides conference, meeting and office space for laboratory staff and more than 1,300 researchers from around the world who conduct research here. 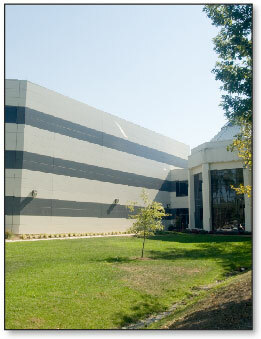 CEBAF Center also houses the Computer Center, where scientists can store and analyze data from experiments. They also use the lab’s super computers to run simulations of experiments. 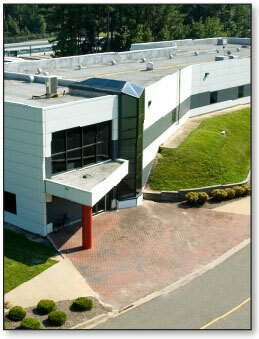 The Test Lab is where Jefferson Lab designs and fabricates equipment and system critical to its research program. It is home to the Superconducting Radiofrequency Institute, a world-leader in the superconducting radiofrequency technology used to accelerate the laboratory's electron beams. Expansion and renovation work is underway at the Test Lab. Along with a new building under construction immediately west of the Test Lab, the entire complex will be known as the Technology and Engineering Development Facility. The Continuous Electron Beam Accelerator Facility is located in a tunnel about 25 feet below ground. The oval-shaped tunnel is about 7/8 of a mile long. The tunnel is about 14 feet across and 10 feet high. Its concrete walls, floor and ceiling are about 21 inches thick. Magnets are used to direct the electron beam around the two arcs of the oval. 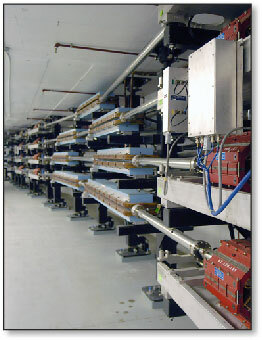 This allows the beam to circulate up to five times before being directed into an experimental hall. With each lap around the accelerator, the beam gains additional energy. Jefferson Lab is home to the world's most powerful tunable Free-Electron Laser. 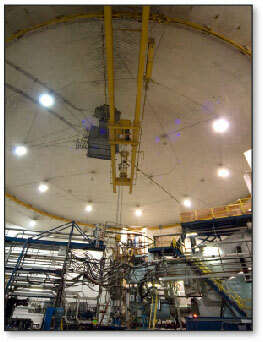 The FEL uses the same superconducting radiofrequency technology as Jefferson Lab's CEBAF accelerator. The FEL has been used to conduct an extensive range of applied and basic research.Unique to the FEL is the range of light it can produce. This tunability allows scientists to test multiple wavelengths of light. Another innovation that makes Jefferson Lab's FEL unique is its use of the energy-recovery linac, which allows the FEL to recycle energy from its electrons. Hall A is the largest of Jefferson Lab's three experimental halls. It is 174 feet across and 80 feet tall from floor to ceiling. Hall A is outfitted with two primary detector systems – both high-resolution spectrometers and each weighing about 450 tons. The systems act like huge microscopes, allowing scientists to "see" inside an atom. Hall A is used primarily for experiments that study the structure of nuclei, and of protons and neutrons. 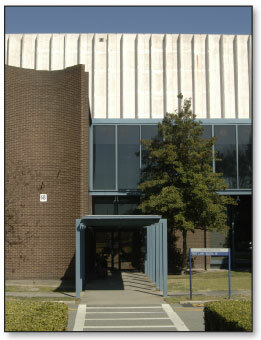 Hall B is the smallest of Jefferson Lab's three experimental halls. It is 98 feet in diameter and 65 feet from floor to ceiling. It is equipped with the CEBAF Large Acceptance Spectrometer, or CLAS, which is shaped like an elongated sphere. Experiments in this hall can receive electron beam or a photon beam. A major research program in Hall B has been the investigation of the quark-gluon structure of protons and neutrons and a detailed study of excited states. Hall C is 150 feet in diameter and 60 feet tall. Hall C houses a High Momentum Spectrometer and has been used extensively for large-installation experiments. These are stand-alone experiments requiring unique or highly specialized detectors, magnets and targeting systems. Experiments run in Hall C have covered a broad spectrum of topics, including the structure of pions, kaon particle production, excited states of the proton, and duality.